Dentist in Pittsburg, KS | Do You know Bertha Buttz? Do You know Bertha Buttz? Posted July 14, 2011 . What you are about to read is based on a recent true event in my life. The names have been changed to protect the innocent. You will notice mine is not changed. Hmmm. I am 99.8% the person involved will not read this. And I am 99.9 % you will not know her either! Not long ago Bertha Buttz presented to my office. She recently had a very bad experience with her new denture. The offending prosthesis was made at one of those “dentures in a day” mills. 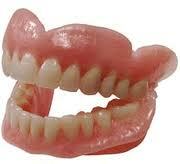 Her good friend, Gertrude Gallant had recently had a denture made by me. Bertha loved the look of Gertie’s smile and decided to make an appointment with me. During the initial interview/consultation, Bertha told me about her nice dentist, Dr. Dogood. Despite how he tried to fix the problems, the new dentures just were not right. He did all he could, but he admitted he was limited because of the nature of the “denture in a day” technique. He suggested she she see a dentist who makes dentures in multiple visits. Amazingly, Gertie’s dentist does! Over the next several weeks, multiple visits were made to me. We took multiple impressions to assure a great fit. We recorded centric relation (dental term for made sure her top jaw and bottom jaw were correctly aligned.) We selected the proper shape and color teeth. We tried her new dentures in to assure the shape, color and all was to her satisfaction. We even had her back for a second try-in to be doubly sure all was well. Every step along the way she verified everything and okay’d our work. She told us she loved the process and the results. Or, so she thought! I graciously refunded her full price, smiled and wished her well. Several lessons were learned from this. 1.) You just can’t please some people–no matter how hard you try. 3.) God put all kinds of people on this earth for variety. 4.) Some challenging people are here to teach us some things–patience, long suffering. We need to look at what we can learn from each other. Here at Albert Mendez DDS PA, Pittsburg Kansas Dentist, we are in practice to serve you. It is called a practice for a reason!! We are passionate about what we do and the time and quality we invest in your dental care. Call us today to make an appointment. Check us out our website, www.pittsburgkansasdentist.com. You can also friend us on Facebook and follow us on Twitter. We would love to serve you! !